Today is which is a good time to start talking to your doctor about your risks for having a heart attack. What lifestyle changes can I make to prevent a heart attack? It is very important to learn the signs of a heart attack. Fast action can save lives—maybe your own. Chest pain or discomfort—it may feel like pressure or a squeezing pain in your chest. It may feel like indigestion. You may also feel pain in your shoulders, arms, neck, jaw, or back. Shortness of breath—often comes along with chest discomfort but can also occur before. Other symptoms—breaking out in a cold sweat, nausea, or light-headedness, upper body discomfort in one or both arms, the neck, jaw, or stomach. Electrocardiogram (ECG or EKG)—This records the electrical activity of the heart as it contracts and relaxes. The ECG can detect abnormal heartbeats, some areas of damage, inadequate blood flow, and heart enlargement. Blood test—Checks for enzymes or other substances released when cells begin to die. They are "markers" of the amount of damage to your heart. Nuclear scan—Reveals the damaged areas of the heart that lack blood flow. It also can show problems with the heart's pumping action. The test uses radioactive tracers to study how blood flows in your heart. Coronary angiography (or arteriography)—A test that uses dye and special X-rays to show the inside of your coronary arteries. You will need to change your lifestyle to help prevent or control coronary heart disease (CHD) and so reduce the risk of a first or repeat heart attack. Anti platelet drugs, such as aspirin, keep blood clots from forming. These drugs help to keep arteries open in those who have had a previous heart bypass or other artery-opening procedure, such as coronary angioplasty. Anticoagulants (blood thinners) prevent blood from clotting or prevent existing clots from getting larger. They can keep harmful clots from forming in your heart, veins, or arteries. Clots can block blood flow and cause a heart attack or stroke. Common names for anticoagulants are "warfarin" and "heparin." Digitalis makes the heart contract harder when the heart's pumping function has been weakened. It also slows some fast heart rhythms. ACE (angiotensin converting enzyme) inhibitors stop production of a chemical that narrows blood vessels. They help control high blood pressure. You may also take an ACE inhibitor after a heart attack to help the heart pump blood better. People with heart failure, a condition in which the heart is unable to pump enough blood to supply the body's needs, may also take them. Beta blockers slow the heart and make it beat with less contracting force, so blood pressure drops and the heart works less hard. They are used for high blood pressure, chest pain, and to prevent repeat attacks. Nitrates (nitroglycerin) relax blood vessels and stop chest pain. Calcium channel blockers relax blood vessels. 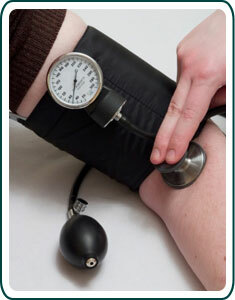 They are used to treat high blood pressure and chest pain. Diuretics decrease fluid in the body. They treat high blood pressure. Diuretics are often referred to as "water pills." Blood cholesterol-lowering agents decrease LDL ("bad") cholesterol levels in the blood. Thrombolytic agents (clot busting drugs) are given during a heart attack to break up a blood clot in a coronary artery and restore blood flow. Many people hear the term "acute coronary syndrome" related to heart attack. But just what is it? Acute coronary syndrome (ACS) is a life-threatening form of coronary heart disease that occurs when the heart muscle does not receive enough oxygen rich blood. Acute Coronary Syndrome includes myocardial infarction, commonly known as a heart attack, and angina, or sudden severe chest pain which typically occurs while at rest. In addition, these terms are often used when researching "acute coronary syndrome" - coronary treatment; cholesterol facts; heart disease; coronary heart disease; heart diagram; cholesterol; heart disease facts; coronary heart disease; acute coronary, heart syndrome or coronary heart disease treatment. Other coronary treatment medical terms used in conjunction with Acute Cardiac Syndrome are heart disease terms such as ACS Guidelines, Pulmonary Embolism Causes, Pulmonary Thrombosis Symptoms, and Atherosclerosis Heart Disease. Every year, Acute Coronary Syndrome affects an estimated 1.5 million people in the USA plus an additional 1.5 million folks in Europe. Even though heart disease patients receive intense ACS management while in the hospital, new treatments are needed to reduce the risk of acute heart attack, stroke, and cardiovascular sudden death. ACS patients receive anti-coagulant drugs but this treatment is hospital-based. Coronary artery disease (CAD) is the most common type of heart disease. It is the leading cause of death in the United States in both men and women. Sometimes, though, you may need medicines. 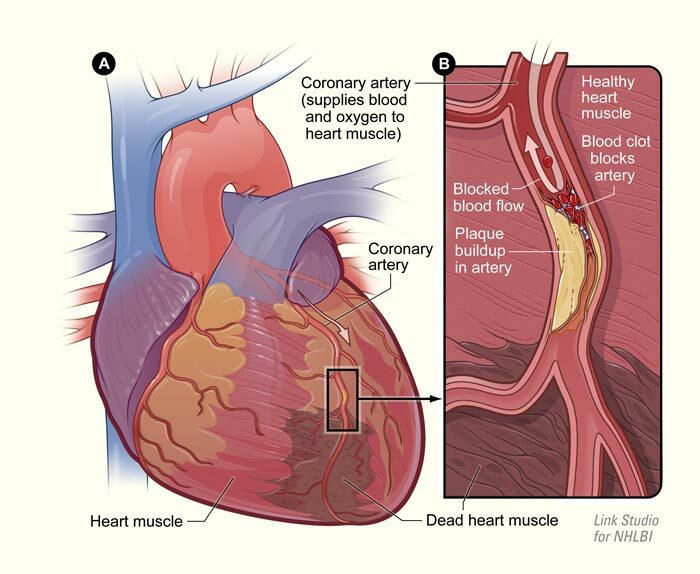 CAD happens when the arteries supplying blood to the heart muscle become hard and narrow. This is due to the buildup of cholesterol and other material, called plaque, on their inner walls. This buildup is called atherosclerosis. As it grows, less blood is able to flow through the arteries. As a result, the heart muscle can't get the blood or oxygen it needs. This can lead to chest pain (angina) or a heart attack. Most heart attacks happen when a blood clot suddenly cuts off the hearts' blood supply, causing permanent heart damage. Over time, CAD can also weaken the heart muscle and contribute to heart failure and arrhythmias. Heart failure means the heart can't pump blood well to the rest of the body. Arrhythmias are changes which take place to normal heart rhythm.